Van Morrison joins forces with jazz organ virtuoso Joey DeFrancesco for new studio album! "Imagine Van and organist Joey Francesco getting together for a late night jam session with some friends and running through a set of Van tunes plus an assortment of standards. You don't have to imagine it because that's what this album sounds like and it's close to how these sessions were produced. ... I strongly recommend you consider getting this one. It's filled with great "live in the studio" music-making, superbly recorded and Van's not sung better or swung more freely on record in quite some time!" — Music = 10/11; Sound = 10/11 — Michael Fremer, AnalogPlanet.com. To read Fremer's full review, click here. 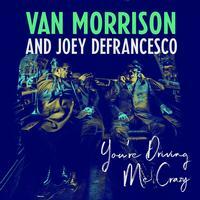 Van Morrison's 39th studio album is You're Driving Me Crazy, a musical collaboration with Hammond organ virtuoso and trumpet master Joey DeFrancesco, from Legacy Recordings, a division of Sony Music Entertainment. The successor to Versatile, Van's chart-topping jazz album from 2017, You're Driving Me Crazy 2LP arrives April 27. You're Driving Me Crazy finds Morrison collaborating in the studio with DeFrancesco and his band including Dan Wilson (guitar), Michael Ode (drums) and Troy Roberts (tenor saxophone). DeFrancesco, who signed his first deal with Columbia Records at the age of 16, has performed with Miles Davis, John McLaughlin, Grover Washington, Jr. and many more while leading his own band, and is responsible for bringing the classic Hammond organ sound back to the world of jazz in the late 1980s. Joey DeFrancesco is a prolific American jazz organist, trumpeter, and vocalist and Grammy nominee who signed his first record deal (with Columbia Records) at the age of 16 and has gone on to release more than 30 albums. He has performed on stage and in the studio with a wide variety of artists including Miles Davis, Jimmy Smith, Ray Charles, Bette Midler, David Sanborn, Arturo Sandoval, Larry Coryell, Frank Wess, John McLaughlin, Danny Gatton, Elvin Jones, and many more. DeFrancesco is a nine-time winner of the Down Beat Critics Poll (organ) and has won the Down Beat Readers Poll every year since 2005. He has won a number of JazzTimes Awards and is an inaugural member of the Hammond Hall of Fame.